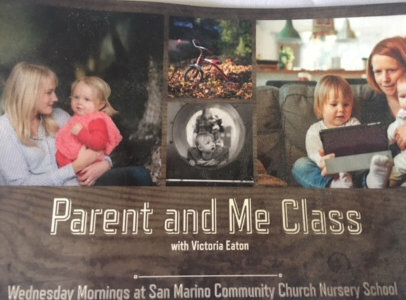 San Marino Community Church Nursery School serves children between the ages of two and a half to five years old. Two-and-a Half Year Olds attend Nursery School Two Days a Week on Tuesdays and Thursdays. The main goal of the Two-and-a Half Year Old class to help children learn to separate from their primary caregivers, and learn the new routines at school. This is a gentle and respectful process that our teachers execute with much love and thought. There is a sense of fluidity and constant motion, as small groups of children cluster around teachers in different areas of the room. A small group is at the play dough table, pounding, poking, and changing the shape in various ways. Two children are at the sensory table, scooping up the packing peanuts and pouring them out again. In the center of the room, three children are using plastic tools as they pretend to fix the table. “Shhh-baby sleeping,” one child says to his friend in another part of the room, as they carefully wrap the baby dolls in blankets. In a cozy corner, a child who has just separated is sitting on a teacher’s lap, comforted by looking at his family photo. Three Year Olds Attend School Three or Five Days a Week. Our unique classroom set-up allows for us to offer very flexible scheduling options. Our Three-Day-a Week offerings include: Monday/Wednesday/Friday; Monday/Tuesday/Thursday; Tuesday/Wednesday/Thursday or Tuesday/Thursday/Friday. Children may also begin the year with three days a week, and move to a Five-Day-a Week schedule as class space permits. In the Three-Year-Old Classroom, children continue to learn routines, extend their attention span during Circle Time, and gain more confidence in the outdoor play spaces. Children are encouraged to asses and tackle measured risks with teachers close by. Indoors, you will see a small group of children at a small table, four children are making pancakes with a teacher, taking turns mixing the wet and dry ingredients together. Two children are playing at the Science Table, which is filled with woodchips, trucks, and shovels. They are creating pathways and deciding which way the trucks should go to reach their destination. Two other children are building a tower on the light table with Magna Tiles, standing on their toes and reaching high to make it as tall as they can. A few children are doing puzzles together on the rug, while another small group of children is nearby looking at books with a teacher. The playhouse is abuzz with children playing “Office” talking on old cell phones and typing on ancient laptops. Up in the loft, two children are putting the baby dolls to sleep. Older Threes/Younger Fours Attend School Three or Five Days a Week. Families have opportunities to create specific Three-Day-a Week schedules to best fit their family needs and schedules. Three and Four-Year-Olds are incredibly inquisitive and are excited to be challenged in the classroom. Each new accomplishment fills three and four-year-olds with pride and the desire to learn more. Here, we focus on independence, helping children adapt to a more structured classroom environment. We know that at this age, children learn best by doing. We use hands-on learning opportunities such as collage-building, sensory tables, blocks, sand and water play. New experiences in a nurturing environment aids cognitive development. Children also learn through conversation—with their peers and with their teachers. 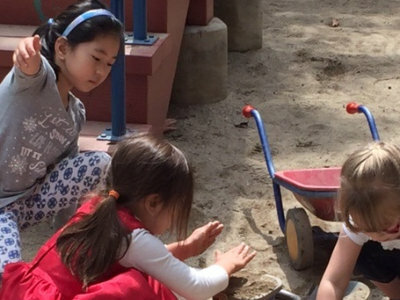 In this environment, children are given endless opportunities to participate in varied conversations and discussions—responding to their environment in many different ways. Pre-K Children Attend School Five Days a Week. Four and Five-Year-Olds are full of energy and curiosity. Through active discovery and hands-on learning, we help children develop the skills they will need for elementary school and beyond. 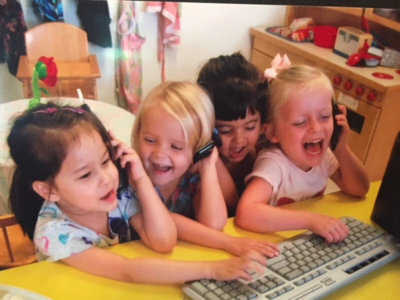 The goals of Pre-Kindergarten are to prepare children for the rigors of elementary school by developing their sense of self, confidence, and an appreciation for others. In the Pre-K room, we can see a few children in the writing area are making cards for their friends, carefully writing their friends’ names and referring to the attendance board to check how each name is spelled. In the Art Corner, two four-year-olds are painting their cardboard constructions. At a quiet table, one child is sitting with a teacher and observing his facial features in a mirror, preparing to draw his self-portrait. Children are granted time, space, and independence to learn and discover their interests and talents and to discover their own sense of self. Transitional Kindergarten Students Attend School Five Days a Week. This unique program is designed to help our students become more comfortable with the transition to Kindergarten and fine-tune the necessary skills to enter elementary school. We help students prepare for this milestone in a variety of fun and challenging ways. 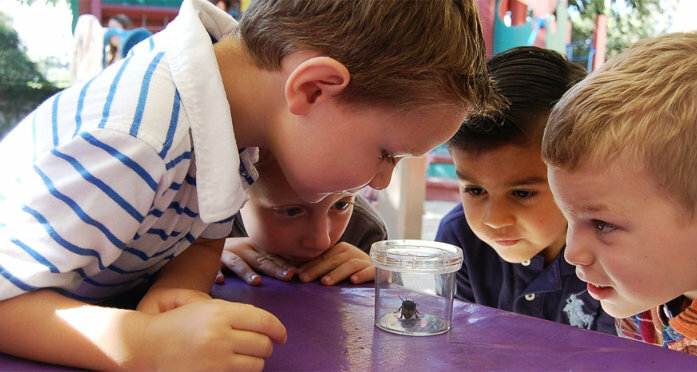 Through more active discovery, layered with specific skill development programs like Handwriting Without Tears, our T-K students develop writing skills, imagination development, journaling, science, math, and literature-based activities. 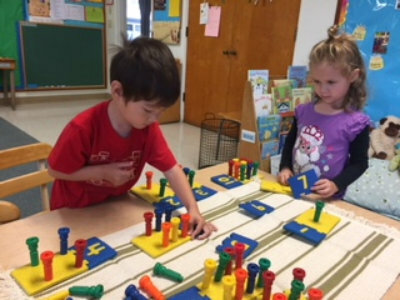 Through our thoughtfully prepared curriculum, our students develop longer attention spans while learning basic concepts that will be expected in Kindergarten. In T-K, children explore scientific concepts with ramps, pulleys, gears, and wheels. The room seems to buzz with voices, movement, and focused activity. In the block area, two children are building an elaborate structure, discussing how many triangular blocks they need to go all around the edge of their building. 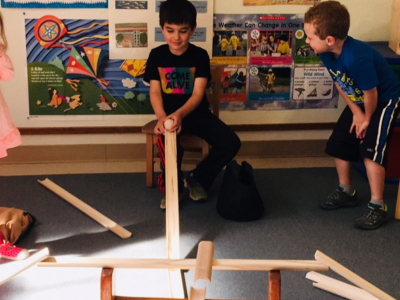 “It’s bursting with color!” Three boys adjust the ramps and conduct tests to see if the felt or wooden balls will roll down fast. Parent and Me Class on Wednesdays. Toddlers ages 18 months to 2.5 years of age will have a chance to come and play in the SMCCNS preschool environment. 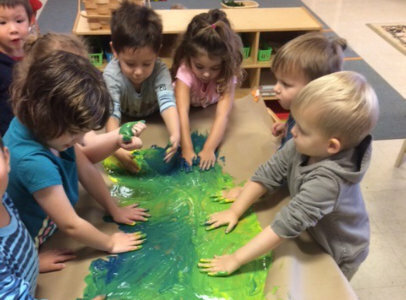 There will be lots of opportunities to learn, explore, get messy, play in water (weather permitting), paint, knead some play dough, and play, play, play. Parents, ( or grandparents/caregivers) and teachers will come together to discover what it really means to be a toddler, including developmental phases, temperaments and more. Parents will also have the opportunity to develop relationships with other parents who have similar interests in fine tuning parenting skills, as well as learning techniques that will help develop families that are respectful, cooperative and empowering. SMCCNS teacher Victoria Eaton M.Ed., will be leading these sessions. Classes met Wednesday mornings from 9:30 am to 11:30 am. Learn more about our Application Process today. If you have other concerns, get in touch with us by calling 626-282-4186 or you can Set an Appointment. You may also use our online Contact Form.